English: Depicting (from left): a Berber (Libyan), a Nubian, an Asiatic (Levantine), and an Egyptian. Drawing by an unknown artist after a mural of the tomb of Seti I; Copy by Heinrich von Minutoli (1820). 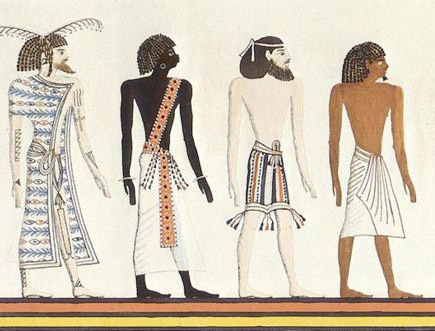 Note that the skin shades are due to the 19th century illustrator, not the Ancient Egyptian original. Source Cropped from File:Races2.jpg, Hornung, The Tomb of Pharaoh Seti I, 1991.